At Gala Bingo, there are no limits when it comes to bingo rooms! This top online bingo site proposes 19 bingo rooms where you can have all the fun you want. The excitement and thrill will surely get to you as different variations of bingo games such as 90 Ball, 75 Ball and 40 & 50 Ball are offered all week long. When it comes to 90 ball bingo, the different rooms you can hop in are The Chase Bingo, Big Banker Bingo, Breakfast, Emmerdale, Metropolis, Deal or No Deal Bingo 90, Castle, City, Coronation St Bingo, Rush, Mountain, Country and All Sorts. Each of these rooms feature different chat moderators which will keep the fun on while you daub your cards. Even if all these rooms host 90 ball bingo, the way and the atmosphere in which the games are played are very dissimilar! If you are a fan of 75 ball bingo, the gateway to these heavenly games are Interstate 75, Deal or No Deal Bingo 75 and 1980 Club. In these rooms, you can select the 5×5 bingo cards which you want to buy. You can have a friendly conversation with the lovely chat moderators while the game is on. Trust your luck, and your numbers will follow! 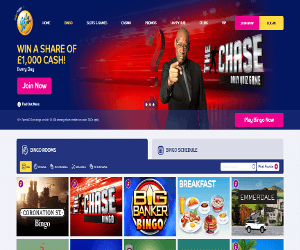 For varieties, the bingo rooms you should instantly enter are Bingo Lotto, Coconut Island and Rainbow Riches. It’s only upon entering these rooms that you will know which bingo games are on! Hosted by experienced chat moderators, these bingo rooms come with the surprise element which will get you jolly!